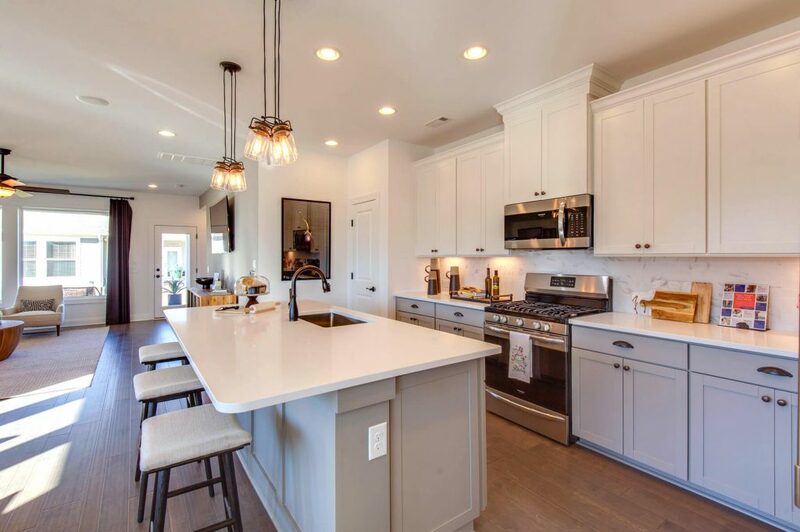 The open floor plans, chef’s kitchens, two-car garages and super showers and double-sink vanities in the master bath are grabbing attention, but there’s one more reason buyers are snapping up the new villas in Durham Farms. 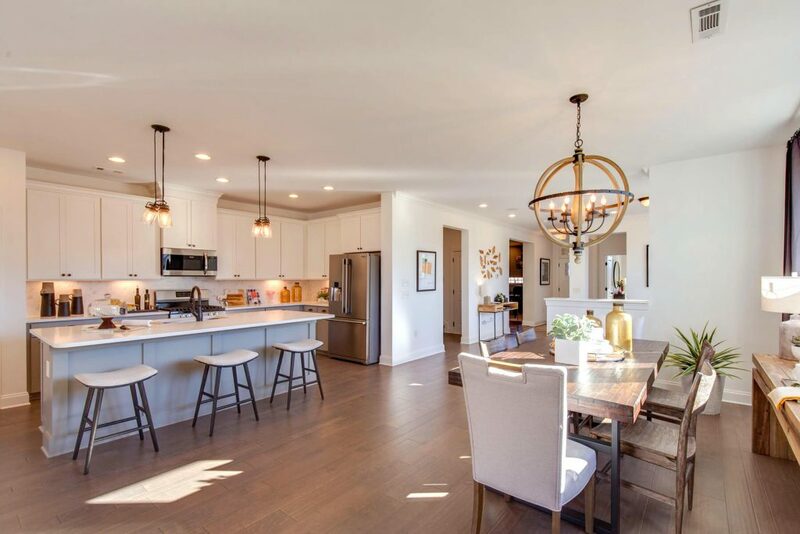 “The feature that most homeowners are interested in is actually a first-floor owner’s retreat,” said Craig Neal, senior sales consultant for David Weekley Homes. The master bath has a twin-sink vanity and a super shower. Buyers have already spoken for 15 of the 34 villas the company is building in Durham Farms, the master-planned subdivision off Drakes Creek Road in Hendersonville. The company plans to build more villas in the future. 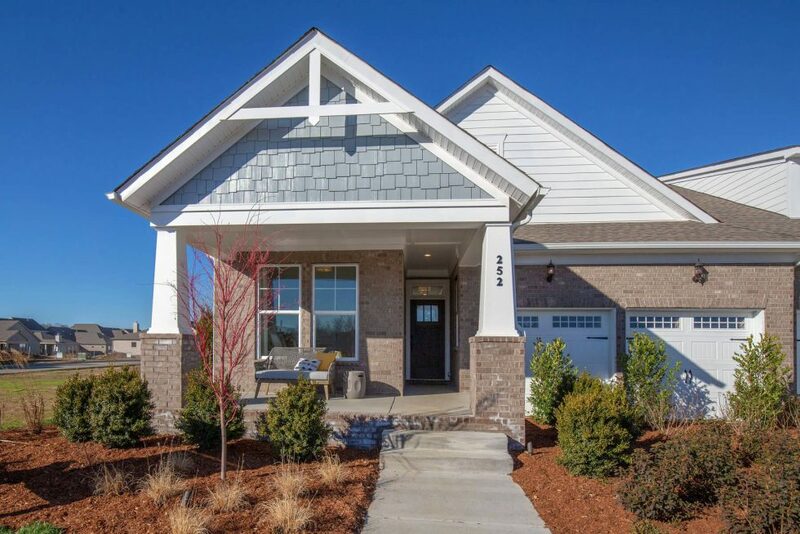 A model home is open to the public. “From a design aspect … the high-end finishes and fixtures of granite countertops, wood or tile flooring or upgraded cabinets are the most sought-after in the Design Center. 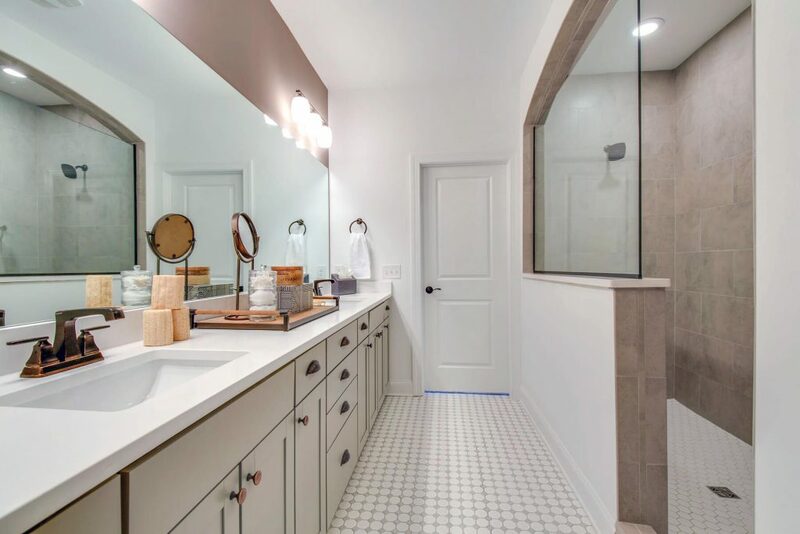 Many buyers are also interested in flex space and (are) choosing a super shower for their owner’s bath in place of a shower-tub combination,” said Neal. “The oversized island in the kitchen is also an attractive feature, ideal for food prep, eat-in dining, entertaining and collecting the day-to-day items that seem to be unavoidable,” he said. The large kitchen island has room for food preparation and dining. The villas come in three floor plans and offer a choice of one-level living or two stories with a bonus area upstairs. Buyers who choose to add the bonus area are using it for entertaining, traditional bonus rooms or additional bedrooms. New owner Debbie Bragg chose a one-level villa without a bonus room. She also customized her floor plan. “I took the third bedroom and opened it up. The living room, the dining room, the office, it’s all open with lots of natural light,” said Bragg. She expects to move in as soon as her villa is finished this spring and is already collecting ideas for her interior design. “In Durham Farms you can go to open houses and get decorating ideas. The builders hire professional designers and I can say, ‘I like that,’” said Bragg. Most of the villas are being built in pairs with the garages placed between them, an arrangement that helps ensure privacy. Bragg’s villa is on a smaller lot and is one of a handful being built as a standalone. She would have been just as happy with a connected villa, she said. “They are so well built there’s no worry about hearing anyone,” she said. The Cheshire has spacious bedrooms. The three floor plans vary in size and price. The Alexia starts at $296,990 and ranges from 1,734 to 1,782 square feet on one or two levels. It has three or four bedrooms and two or three full baths. The kitchen has an island and a pantry. The Cheshire is priced from $319,990 and ranges from 1,910 to 1,923 square feet on one or two levels. It has three or four bedrooms and two or three full baths. This floor plan has a covered porch. The Bradford floor plan starts at $339,990 and ranges from 2,227 to 2,289 square feet. It has two stories, three to five bedrooms and two or three full baths and one half-bath. Features include a covered porch, downstairs powder room and an enhanced laundry room. The open kitchen and dining area is perfect for entertaining. “The greatest attraction of the villas is the freedom of low-maintenance living with the comforts and luxuries that homeowners are looking for,” said Neal. Villa owners can enjoy The Farmhouse at Durham Farms, featuring a pool, fitness center and gathering areas as well as parks and trails in a community designed to encourage residents to spend time together. 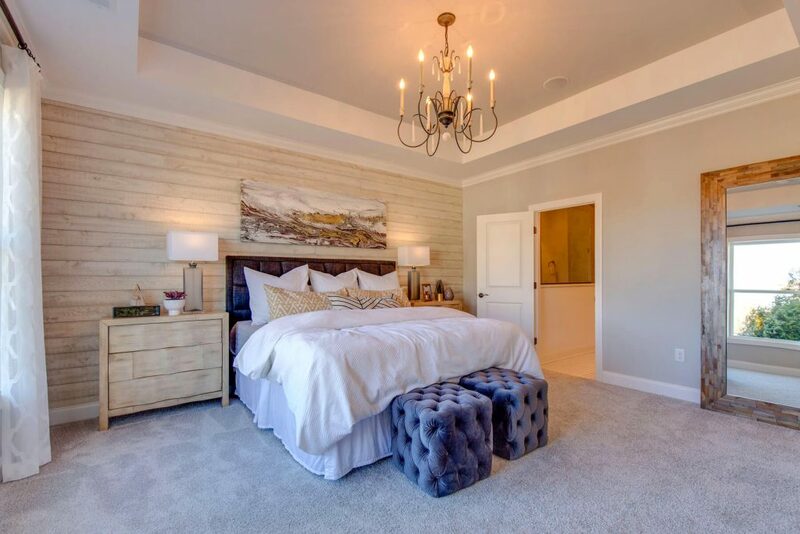 “Homeowners want to be able to go home at the end of the week and relax with all of their comforts close by and Durham Farms Villas offers that, in addition to beautiful floor plans designed around their lifestyle,” said Neal.